Houseplants add so much texture and life to a space, so they’re one of my favorite ways to decorate my home, especially since I love minimalism so much. It’s also super rewarding to watch them grow. There’s nothing like seeing a new baby leaf on a plant you’ve been caring for! But maybe you’ve brought home a succulent or two and watched it whither away despite your best efforts. Don’t worry, there is still hope. We can turn your black thumb green, you just need to know the basics. 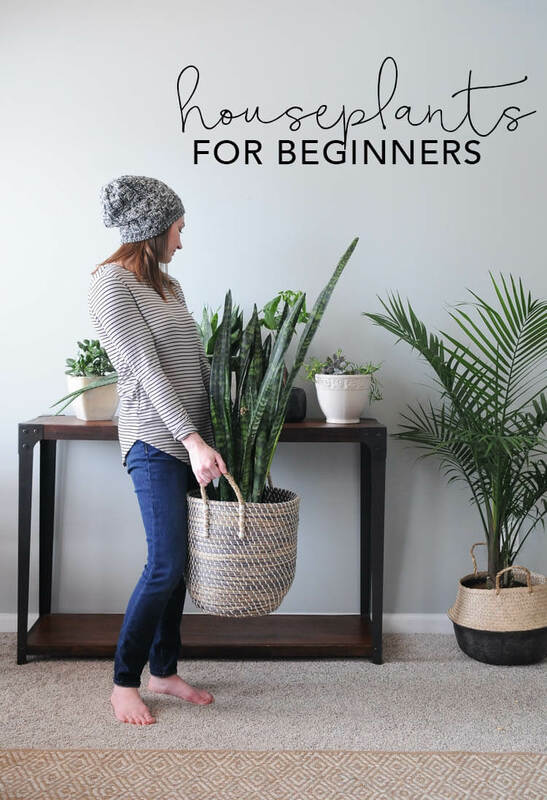 Buying the right houseplants for beginners to start with and learning the basics of plant care is all you need. 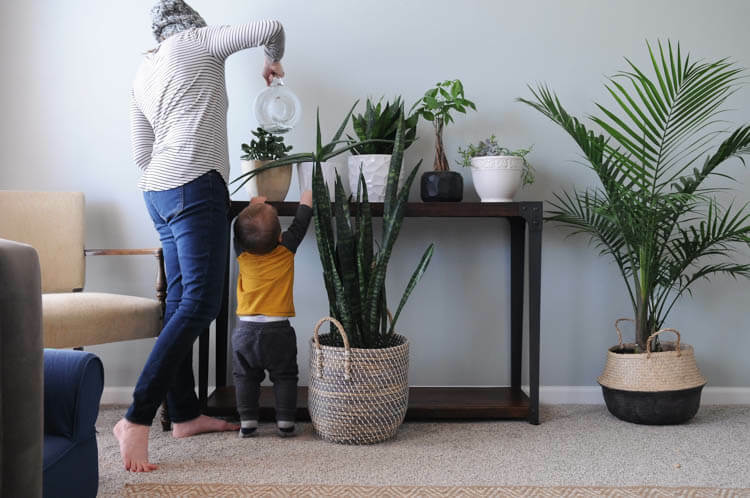 The reason you may have had issues keeping your houseplants alive in the past is because the balance of these 3 things was off in some way. So let’s dig into these 3 things so you have a better idea of how they work together. I know they seem straight forward enough, but it’s so easy to have too much of one or not enough of the other if you don’t understand the balance. How much sunlight does my houseplant need? You already know sun is important for your plant. But determining how much sun it needs or exactly where to place a plant in your home is the tricky part. Typically, plants are classified as high light (full sun), medium light (bright indirect sun), or low light plants. The biggest thing to know is the amount of sunlight a plant can absorb greatly decreases with every foot you move it away from the window. So a low light plant might actually need to be closer to a window than you would originally assume. Another thing that’s easy to overlook is that not all windows are created equal. If the window is shaded from the outside (by a porch or tree or something similar), your plant won’t be getting full sunlight in that spot. Medium sun plants will be happiest in a shaded window or a spot near a window that receives direct sunlight from the window. Low light plants can be happy in shaded areas of your home, but need to be in rooms that receive some amount of natural light. One last note on light is that low light plants still need to be near a light source. They won’t thrive in a dark corner or a room with no windows. A pothos is a great low light plant and for me they’re the only ones that have survived on a wall opposite of a window, but they do still need some amount of sun. How often should I water my houseplant? Knowing how much to water your plants always feels like a mystery in the beginning. I killed the first few plants I brought home because I didn’t understand that all the basics of taking care of a plant depend on one another. Before I learned about the relationship between sun and water I assumed any time a plant wasn’t doing well it needed more water. Consequently, I drowned most of my early plants. The amount of water your plant needs depends on the type of soil environment the plant prefers and the amount of sunlight it’s exposed to. Some plants prefer dry soil, some prefer mostly dry soil and some prefer moist soil. If your plant prefers dry soil, you’ll need to wait for the soil to dry out completely and will probably only need to water your plant once or twice a month. If your plant is absorbing more sunlight, the soil will dry out sooner and you’ll need to water it more. Because of this, most plants need watered more often in the summer when there are more hours of daylight than the winter. Plants that prefer mostly dry soil need to be watered when the top inch or so of the soil has dried out and plants that prefer moist soil should be watered more regularly. I have streamlined most of my plants onto a weekly, biweekly and monthly watering schedule based on their preferences and how quickly their soil dries out. It’s normal to need to tweak the amount of water you provide as you get to know your plants better. Usually the leaves can point you in the right direction and you can adjust as you go. Typically if the leaves turn brown and start to shrivel up, your plant needs more water. If they turn yellow, the plant probably needs less. Most plants also need a decent way for the water to drain so their roots don’t rot. I really like putting my pots in baskets, so I use these little plastic saucers. For the ones I’ve replanted in pots, I put rocks in the bottom to allow for some drainage. Does my plant need plant food? 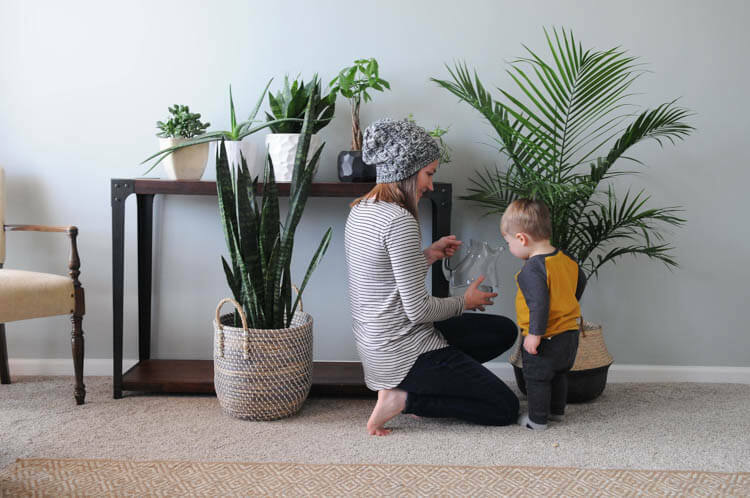 The third way to keep your houseplants healthy is to ensure they have the right kind of soil. Different types of plants prefer different soil, usually based on the amount of water the soil holds. Potting soil also comes filled with the nutrients your plant needs. However, over time as your plant absorbs these nutrients and watering washes some of them away, you’ll either need to fertilize your plants or repot them with fresh soil regularly. Repotting every year or two is sufficient! Most people only recommend using fertilizer once or twice a month during the summer. Those are the months plants are in a natural growth phase. It’s also important to use pots with drainage holes. No drainage holes may lead to root rot which would eventually kill your plant. Plants can go into shock when they’re moved into a new environment. So when you bring a new plant home, try not to move it around too much. Leave the plant in one spot for at least a month (unless you find the light conditions are not working out). This way it can adapt to the temperature, humidity and other unique factors of its new home. One way to determine how to keep your plant happy is to research where it grows naturally. Then try to mimmic those conditions in your own home. For example, desert plants go a long time with no water and then receive occasional downpours. So generously water those plants on their watering days. I like to plant full sun plants like succulents outside during the summer months so they get plenty of sun and establish a good root system before moving them in for the winter and converting them to houseplants. I have had quite a bit of luck keeping succulents inside as houseplants, but they’re not as carefree as some people make them out to be. If you take your houseplants outside in the summer, gradually expose them to the sun because they can end up getting burnt from the sudden exposure. I have an entire list of the best houseplants for beginners, but these are my 4 favorites I recommend to everyone. Snake plant – I have 4 snake plants, I love them so much! There are a few different types of them to choose from. They’re super hardy, don’t require a ton of light and super forgiving if you never water them. Also they look great almost anywhere in your home! I love the color and texture they add! Also – this faux snake plant is the most convincing faux plant I’ve found. I have it in my toddler’s bedroom and it looks great! Pothos – I have 2 of these and they’re perfect for open shelving or anywhere you want a viney plant. And they’re the only plants I’ve been able to keep alive on the opposite side of a room from a window. Great low light plant! Aloe – these can get huge! I really want to keep repotting mine so it can keep growing. Jade Plant – Super easy to grow and I would recommend this one to any beginner! Mine is pretty big now! Start it off in a sunny place then once it’s established it can live just about anywhere! Alright, there ya have it! My obsession with houseplants is real! Feel free to drop any extra advice you have for houseplants in the comments! 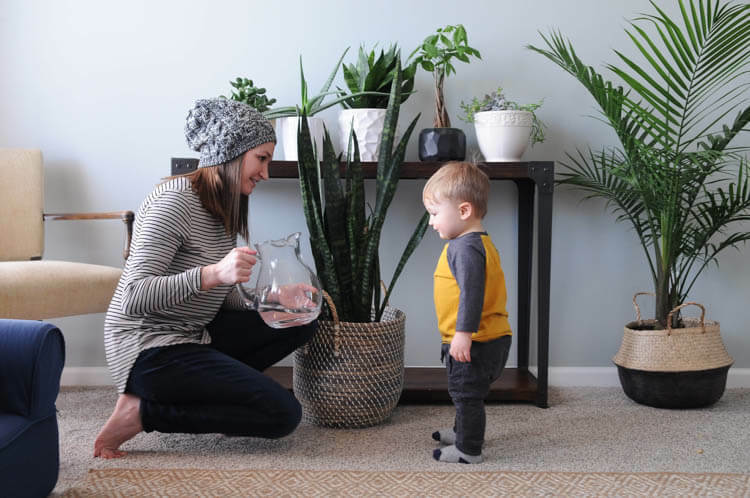 If you need help staying on a watering schedule for your houseplants, download this free houseplant watering guide! I have only one houseplant that has managed to survive my “abuse”. LOL! It was given to me many years again and it just keeps hanging on. I’ve been thinking about arranging a terrarium with succulents though. So this post comes in handy. Those are the best kind of plants! Good luck – lots of sun, not much water! Where did you get the basket looking pots? Love these tips! Thanks for sharing! Also, how cute are your baskets?? I need to try that. Thanks, Angie! I’m obsessed with cute baskets :) The cursive is bellwethers and the sans serif is just avenir. I’m not a web designer and spent WAY too much time trying to find those fonts so I’m glad you think they jive! Do you know the name of the plant you are holding in the first picture? Thank you!! I love plants in my home and have made it my business to buy ones that are hard to kill! Anything I can get on a bi-weekly watering schedule works great for me! 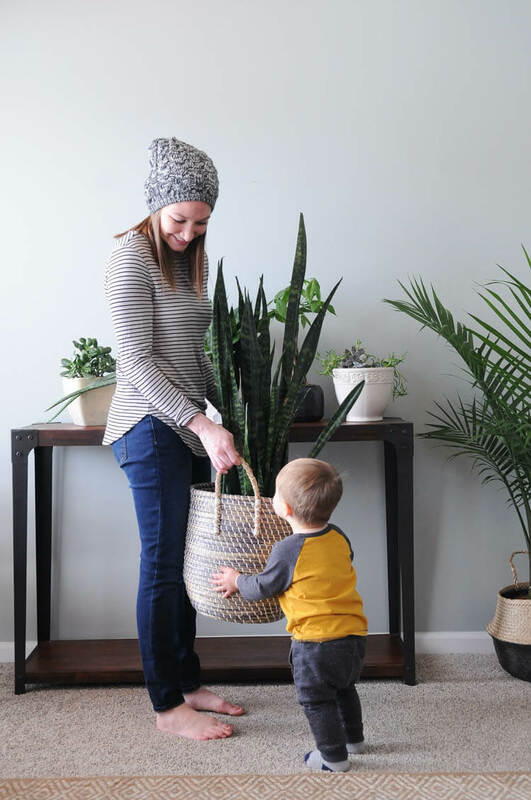 How did you plant the snake plant in a basket ? Did you just use a plastic liner and soil or another pot inside of the basket? I just left it in the plastic container I bought it in and put a plastic liner under it! Super easy! Is there a point where you have to put it in a bigger pot? If so what would you put it in to keep it in a basket? Thanks! This article has some great info: http://www.dummies.com/home-garden/gardening/container-gardening/when-does-a-plant-needs-repotting/ Hope that’s helpful! I’d probably just find a cheap plastic pot that’s bigger to replant it in and put that in the basket with the tray! My snake plant is looking sad (not standing straight) and some leaves’ roots are rotting. I’ve had it for two years. My suspicion is I need a bigger pot and more dirt, but I’m afraid it will die if I transplant, which I also don’t know how to do. Please help! Yikes! I need to transplant some of mine but am kind of nervous too. I’ve heard you can take them outside on a nice day and completely wash all the dirt off the roots, then place it in fresh soil. I wish I had more advice for you about this, I will make an effort to transplant one of mine soon and see how it goes so I can be more helpful! This post is very helpful and I have shared it for others to see. :) So far, I have only one plant, that, like someone mentioned in the comments, has survived. But I am adding more plants and you have listed great options! Thanks for sharing! Good luck with your new plants! It’s so rewarding once you get it down and start keeping more alive! You can do it! I always kill houseplants too :( That’s a good tip about being able to drain them so the roots don’t rot. I also think I over water sometimes. Now I water them every two weeks and that seems to be doing okay! We also have to be careful what we buy because many standard houseplants are poisonous to cats, including aloe vera (which is such a shame because I love it, and it’s useful). Thanks for the tips, I love how you arranged the plants to make that space look nice. I’ve been meaning to get some house plants but my youngest has allergies to lots of things, so I’m quite hesitant. Which plants would you suggest that are less allergenic, if there’s such a thing? Very nice article. I enjoyed reading it. The tips are really helpful, thanks for sharing.